LIGO Gravitational Wave Detectors That Hunt For Ripples In Space-Time Upgraded The twin sites in the Laser Interferometer Gravitational-Wave Observatory are about to go back online. New hardware should make them able to sense more colliding black holes and other cosmic events. 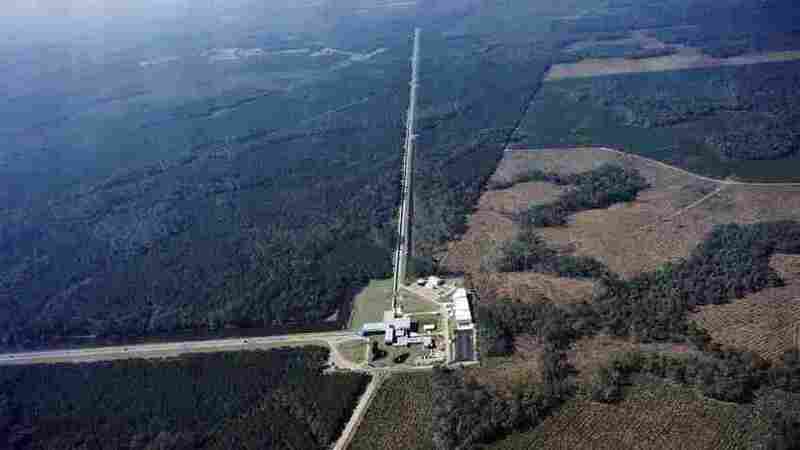 The Laser Interferometer Gravitational-Wave Observatory is made up of two detectors, this one in Livingston, La., and one near Hanford, Wash. The detectors use giant arms in the shape of an "L" to measure tiny ripples in the fabric of the universe. This artist's animation shows the merger of two black holes and the gravitational waves that ripple outward during the event. Now they're getting ready to discover more of these cosmic events. On April 1, the twin facilities in Louisiana and Washington state that make up the Laser Interferometer Gravitational-Wave Observatory will start doing science again after being shut down for more than a year so that workers could install hardware upgrades. The project is funded by the National Science Foundation and the improvements should dramatically increase the detector's ability to sense some of the most mysterious and powerful events in the universe. "So far, we've seen 11 things. Maybe we'll see twice that many this year," says Joseph Giaime, head of the LIGO Observatory in Livingston, La. Researchers will also be helped by the fact that a third detector in Italy, called Virgo, will be up and running. It was only online for the very end of LIGO's last observation period. Having more detectors working together makes it easier for researchers to locate the source of gravitational waves in the sky. What's more, a new detector in Japan called KAGRA is expected to join in at some point. A visualization of the 10 merging black holes that LIGO and Virgo have observed so far. As the horizons of the black holes spiral together and merge, the emitted gravitational waves become louder (larger amplitude) and higher pitched (higher in frequency). Being able to sense gravitational waves is new for astronomy, which has spent centuries studying light. But black holes don't emit light, and these detectors offer a new way to probe their secrets. "Galileo invented the telescope or used the telescope for the first time to do astronomy 400 years ago. And today we're still building better telescopes," notes Gabriela González, professor of physics and astronomy at Louisiana State University. "I think this decade has been the beginning of gravitational wave astronomy. So this will keep making progress, with better detectors, with different detectors, with more detectors." She worked on gravitational waves for years before they actually were detected and says friends now confess that they worried about her career because the task was so hard that it seemed the waves might never be detected. Now, she says, they are jealous that she works in such a cutting-edge field. 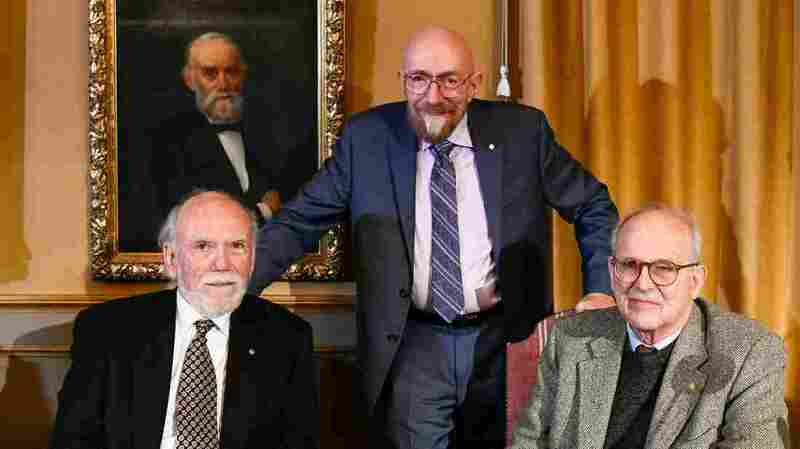 The 2017 Nobel Prize in physics laureates (from left) Barry C. Barish, Kip S. Thorne and Rainer Weiss, pose during a joint news conference in December 2017 at the Royal Swedish Academy of Science in Stockholm. Each LIGO detector in the U.S. is made of two long, concrete pipes that come together in what looks like a huge letter "L." Each arm stretches out for more than 2 miles. "I've spoken with pilots who fly over this who wonder why there is a pipeline that starts nowhere, travels a couple miles, turns right and then also goes nowhere," Giaime says. Inside the pipeline is a powerful laser beam that bounces back and forth between mirrors. Scientists use this laser to precisely measure the length of each arm of the L. When a gravitational wave passes through and distorts space, the lengths change by a tiny, tiny bit — a fraction of the width of a subatomic particle. Giaime says some of the recent upgrades to the detectors include types of hardware that boost laser power and reduce certain kinds of "noise" in their measurements. "We replaced some optics, which is a lot of work," he says. This time around, if LIGO detects gravitational waves, the team will send out public alerts so that anyone can point a telescope at the right spot in the sky in case, like the neutron star collision, the event sends out any observable fireworks. "We've only seen this handful of black holes out of all the possible ones that are out there. There are many, many questions we still don't know how to answer," says Nergis Mavalvala, a gravitational wave researcher at MIT. Plus, she says, there's always the possibility that something completely unexpected will go boom and leave perplexed researchers scratching their heads. "That's how discovery happens," she says. "You turn on a new instrument, you point it out at the sky, and you see something that you had no idea existed."